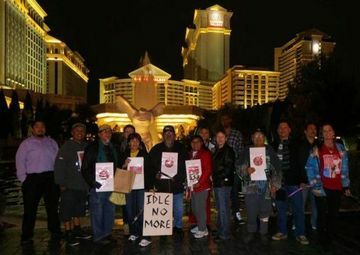 As part of the Idle No More movement‘s worldwide call for action Las Vegas activists will be joining members of the Moapa tribe of Paiutes to demand the closure of the outdated and environmentally disastrous Reid Gardner power plant operated by NV Energy. 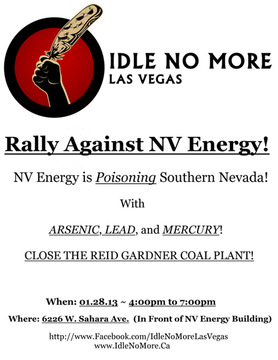 The coal that fuels Reid Gardner is not only unnecessary with current technology, but more importantly, has been polluting the air over the skies of the Moapa tribe’s homes at their reservation, which is located alongside it. Major health and breathing problems, as well as premature deaths (including dramatic increases in childhood mortality rates) among Moapa tribe members has been traced back to emissions from the plant. In addition, clouds of polluted air can be visually observed on the reservation. We will be meeting at the offices of NVEnergy (on Sahara) at 4:00pm.